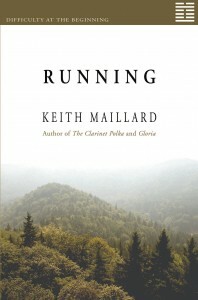 RUNNING IS NOW AVAILABLE AS AN E-BOOK. Calgary: Brindle & Glass, September 2005 (trade paper). Running is the beginning of Difficulty at the Beginning. It covers John Dupre’s high school years, 1958-60. I never thought of Running as a YA, but shortly after it was published, I saw it on the YA shelf in an independent book store, and I thought, hey, that’s not a bad place for it. I knew that my teenage protagonist must appeal to at least some contemporary teenagers; my younger daughter and her friends gave the book positive reviews when they were still in high school. SPRING. WATERY lemon sunlight in the afternoon, throwing a false warmth that’s gone by twilight. Clouds unrolling in high sinister patterns, casting a strange greenish light as I sit in study hall tense and filled with foreboding. Then cold driving rain for days at a time and something hurting in me like a spiritual toothache. In the mornings I wake with despair. The days are asking something of me, but I don’t know what it is or how to reply. I’m sixteen years old, and I feel caught in a fine mesh net. A tremendous power is flowing underneath me, but I don’t know how to touch it. Lyle sniffs the air like a dog, grins at me with wry satisfaction. “Track season,” he announces, as though that statement justifies everything, as though our lives have rolled down to that one meaning: to run.